The kitchen is one room guaranteed to be used every single day, and is often referred to as “the heart of the home.” Not only is the kitchen used for cooking, storing food and storing kitchen utensils and equipment, it is often used for socializing and gathering with family and friends. This makes it difficult to maintain a kitchen’s cleanliness and organization on a daily basis. There are some ways in which you can wisely store away items in the kitchen or disguise them so that they don’t create an eyesore. 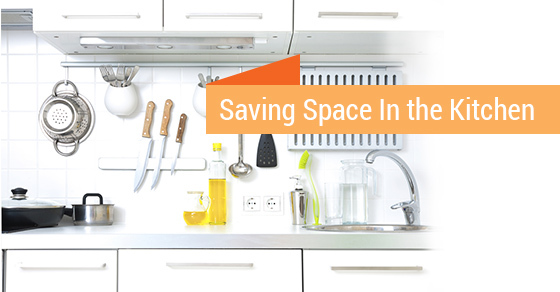 Space saving solutions are often times wise and should be utilized within your kitchen if you wish to keep it clean. When you’re talking to your renovation specialist at Avonlea, keep these tips in mind as requests to help make your ideal kitchen space a reality. Hang utensils from the wall when they’re not in use. You can have your kitchen renovator design a shelf with hangers to mount on the wall, or you can get creative and make your own. An upside down metal rake works wonderfully and fits in with rustic décor! Use baskets to better organize small utensils and accessories. Have customized cabinetry designed to match the décor of your entire home, not just your kitchen. Keep pots, pans and other similar items in drawers and cabinets if the space is provided. If your pots and pans cannot fit into the cabinets, install a pot rack to hang above your island or counter. This will make great use of otherwise wasted space and makes for a great opportunity to show off your cookware! Use a magnetized strip on the wall for knives instead of using a wooden knife block that takes up counter space. Hang coffee mugs below cabinetry for extra cabinet space. Use a towel rack and shower curtain hangers to hang herbs, kitchen utensils, and other frequently used kitchen items. Find old shallow pop bottle crates to hang on the wall and use for spices. Use a small table and stools for a kitchen table. Tuck stools under the table when they are not being used. Create a wall of shelves to display expensive china and kitchen décor. Use a pretty soap dispenser for dish soap. It allows the kitchen to look cleaner. You can even drill a hole in the lid of a mason jar and put the soap pump dispenser through the hole for a more rustic appeal. Put your paper towel roll inside of your cabinetry by adding a pole for it to slide through on the cabinet’s door. Use wire baskets inside of drawers to keep utensils separated and easier to find. If you’re looking for creative storage solutions for your new kitchen, contact the experts at Avonlea for advice and instillation!